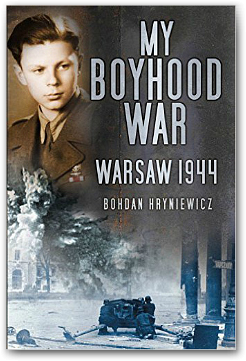 In September 1939 Bohdan Hryniewicz was eight and a half years old. He lived in Wilno (Vilnius), Poland, with his parents and older brother Andrzej. Every summer the boys moved, with their governess, to their country house three miles from Wilno. There they played with the sons of military families. Wilno, close to the Russian border, had several Polish Army regiments stationed there. That year the boys returned early to Wilno: mid-August rather than mid-September. They overheard talk of war with Germany. They saw less of their father and their favourite Uncle who commanded a squadron of armoured cars. The radio played martial music and on 30 August large yellow posters appeared in the streets ordering the mobilisation of the military. War was coming to Poland. On 1 September 1939 Nazi Germany attacked and invaded Poland. Bohdan awoke to the sound of the radio, his mother was listening to the news of the invasion. Wilno was deserted as all the motor vehicles had been requistioned by the army. On 16 September the air sirens blared, the German air force bombed the railway station. The following day Soviet Russia attacked Poland from the east. Early on the morning of the 19 September Russian tanks rolled into Wilno. The Russians ordered that all Polish Officers should register at their headquarters. Of the few that did, they were detained and most were never heard from again. The Soviet Secret Police (NKVD) arrived in Wilno a few days after the Russian army. They began to arrest prominent Poles. At the end of October the Russians moved out and the Lithuanian Army were given control of the city. The tower on Castle Hill now flew a large yellow, red and green Lithuanian flag rather than the red and white Polish flag. De-Polonisation began. Wilno University the second oldest in Poland was closed. Polish school teachers were laid off. All the streets were renamed in Lithuanian. On 10 May 1940 Germany attacked France. By the end of June France had capitulated. On 17 June the Soviet Union occupied Wilno for the second time. By the autumn the independent baltic states had ceased to exist, instead they were now absorbed into the Soviet Union as socialist republics. In June 1941 the NKVD conducted mass arrests. People were taken from their homes, loaded onto trains of cattle trucks and deported into exile in Siberia. Bohdan's uncle Richard was deported to a gulag in the Artic circle and his wife was taken to a collective farm in Kazakhstan. In June 1941 Nazi Germany turned on it's Soviet ally and attacked them. Once again German planes bombed Wilno railway station. The German army occupied Wilno and for days large columns of captured Russian soldiers marched through the streets of Wilno. The Germans established a ghetto for Jews in Wilno. A third of the population of Wilno was Jewish. The Germans executed large numbers of Jews and some Poles in the nearby Ponary forest. By December 1941 the Germans had suffered reverses in their campaign against the Soviet Union. In early February 1943 the Soviets defeated the Germans at the Battle of Stalingrad. Bohdan's mother upon hearing this news said: "We have to move to Warsaw, we will never see Wilno Polish again". In March they left Wilno for Warsaw. They initially stayed with his mother's aunt before moving to a boarding house in Sienna Street in April. That month the Jewish uprising in the Warsaw ghetto started. By the middle of May the Germans had eliminated the Jews and demolished all the buildings in the ghetto. In Warsaw Bohdan saw evidence of the Polish Underground. On buildings the symbol "PW", in the shape of an anchor, was painted. It stood for Polska Walczy (Fighting Poland). Bohdan wanted to join the Boy Scouts which were associated with the Underground. He was accepted and chose the code name for himself of Sokol (Falcon). They met twice a week and he was trained in communications, map reading and first aid. Age 12 to 14 called Zawisza - aim prepare themselves for auxiliary military service in the case of an uprising. Age 18+ called Grupy Szturmowe (Assault Groups) - incorporated into Home Army and used on special operations. I vow to serve in the Grey Ranks, to safeguard the organisation's secrets, to obey service orders and to never retreat before the sacrifice of my life. In January 1944 Soviet forces crossed the 1939 Polish-Soviet border. By July 1944 the Germans had begun to evacuate Warsaw fearing an imminent Soviet attack. Hitler issued an order that Warsaw was to be defended to the last man. On 1 August at 5pm the Warsaw Uprising began! The Polish Home Army in Warsaw launched their long planned attack on the occupying German Army. Bohan heard the sound of heavy fighting from the direction of Napoleon Square. There was machine gun fire and explosions. The Polish flag of red and white began to appear on buildings. News came through that the Post Office building in Napoleon Square was now in Polish hands. Bohan later watched as the Kilinski Battalion who had captured the post office building marched down Szpitalna Street. On day four of the Uprising Bohan and his brother came across two Polish soldiers in their courtyard. They took the soldiers to an attic in their building which provided them with a good firing position. They shot at and hit a German soldier on a tank. The tank replied by firing a shell which destroyed the attic wall. They all ran for safety and survived! Bohdan said to the Polish soldiers that he and his brother wanted to join their unit. The Polish soliders took them to meet Lt. Nalecz (Stefan Kaniewski) the commander of their unit, the 1st Assault Battalion KB Nalcez. Lt Nalcez said they could join the unit as runners as long as their mother gave permission (she did). Bohan was told that he would be Lt Nalcez's personal runner and that he was to stick with him at all times. The battalion consisted of 70 men. The battalion had orders to move to the Wola district. They made their way there but found that Polish units were under heavy attack and were withdrawing to the Old Town. The Nalcez battalion was the last unit that managed to get to the Old Town before the Germans surrounded it. The battalion took over the defence of the town hall building. The Nalcez battalion now had 200 men as more volunteers wanted to join the unit famous for its defence of the town hall. On 12 August the Germans captured a barricade in Leszno Street which was protecting the main access to the Old Town from the west. The Polish Parasol Battalion recaptured it but then the Germans re-took it. The Nalcez battalion received orders to recapture it. Fifty Germans were killed in the attack and many more wounded. Around 6pm one evening Bohdan heard a very loud explosion from the Old Town. A German armoured vehicle which had been captured by the Poles exploded. It had been booby-trapped by the Germans. More than 300 people were killed. The Boy Scout Company Orlat lost 80 of their members. On 20 August Bohdan learned that his brother Andrzej had been wounded and taken to the field hospital at 7 Dluga Street. Bohdan went to the hospital to look for him but could not find him. Bohdan returned to the battalion. A battalion which in the previous eight days had lost 49 dead and had over 100 wounded. On 28 August Lt Nalecz received an order that the remnants of his battalion should leave the Old Town and make their way through the sewers to the center of the city. On 2 September the Old Town was captured by the Germans. They went on a murderous rampage. Around 5,000 soldiers, along with 6,000 civilians, had managed to escape through the sewers before the Germans took the Old Town. On 1 October an agreement was reached for the evacuation of the civilian population from Warsaw. On 3 October the Polish Home Army, after 64 days of fighting, surrendered. Polish units were to lay down their arms and march out in formation under the command of their officers. Lt Nalecz decided that Bohdan should leave Warsaw as a civilian with his mother rather than become a prisoner of war. Bohdan and his mother left Warsaw and walked for about 10 miles before they arrived at a German transit camp called Durchgagslager 121. There was no electrcity or heat. They slept on cold concrete floors. The Germans conducted a selection process deciding who would be sent to Germany for forced labour, to concentration camps or be resettled in the countryside. Bohdan and his mother were resettled in the village of Koscielec. In November they moved to Rzerzusnia, which was nearer Warsaw. In January 1945 the Soviet Army replaced the Germans in Rzerzusnia. The war ended in Europe in May 1945 when the Germans capitulated. The Soviet Union imposed a communist government on Poland. The Soviet Secret Police (NKVD) sought out and destroyed what remained of the Polish Underground. Bohdan and his mother explored different ways of escaping from Poland. At Christmas 1946 they were smuggled across the border into the Soviet Zone of Occupation in Germany. They made their way by train to Berlin and on 31 December left Berlin by train to a town a few miles from the British zone of occupation. There they were smuggled into the British zone on 1 January 1947. Bohdan and his mother made their way to Meppen, which was the HQ of the 1st Polish Armoured Division, and where there was a transit camp for recent escapees. His mother joined the Polish Women's Auxiliary Service. In May 1947 Bohdan's mother was redeployed to Great Britain, Bohdan also arrived in Britain a couple of months later. After spending two years there Bohdan left for a new life in the USA. On 1 August 2014 at 5pm, on the 70th anniversary of the Warsaw Uprising, Bohdan stood in the Powaski Military Cemetery in Warsaw. Sirens wailed throughout the city and salvos of honour guard echoed between the graves as Bohdan remembered all those who gave their lives for Poland. Publisher The History Press in 2015. This page was added on 21 September 2016.